Starwood Preferred Guest (SPG) Asia Pacific MasterCard Promotion ‘Two Days of Happy’ – Stay 5 Nights Get One Free Night Certificate – Stay 9 Nights Get Two Free Night Certificates – 4MCFN. Starwood is again running MasterCard affiliated promo ‘Two Days of Happy’ 4MCFN in the Asia Pacific region. After five nights during the promotional period the SPG member will receive one promotional fee night award, or after nine nights two promotional awards. The stays must be reserved and paid using a MasterCard, and must occur between November 29th, 2011 and 15th of March 2012. These promotional awards can be redeemed from January 1st, 2012 and are valid until 10th of April 2012. The full terms and conditions of this promotions can be found at http://www.spg-asiapacific.com/2daysofhappy/en/terms.html and the frequently asked questions at http://www.spg-asiapacific.com/2daysofhappy/en/faqs.html. 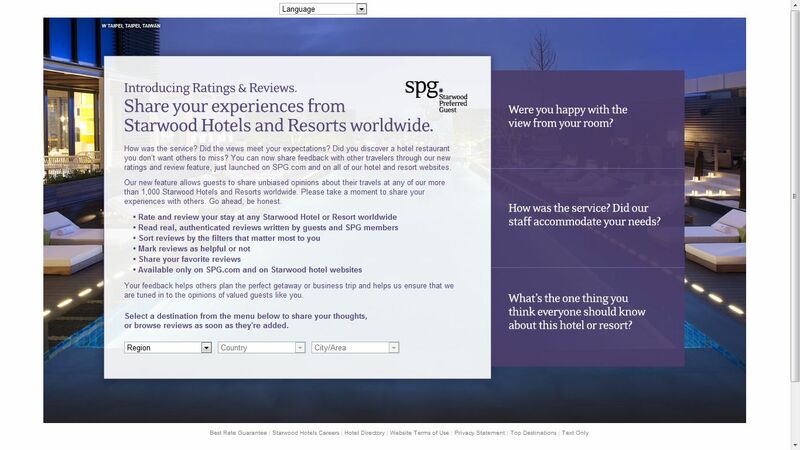 Starwood Preferred Guest (SPG) Moments – Great Way to Get Access to Fabulous Events Using Starpoints. Starwood has already had for more than a year their Moments-program where SPG members can either purchase or bid for wide variety of events like concerts, golf related events, shows etc. There are two ways to “purchase” these and you always have to pay using Starpoints. Some of the events are purely sold using auctions, and thus the price is never knows before the auction ends. It is wise to bid only at the very last minute. The others have the straight purchase price as shown in Starpoints. Couple of days ago I wrote about the new Starwood Promotion that would be launching today. It was already known that it would require you to book a special rate plan in order to be eligible for the extra points and amenities. It was not known, however, whether these rates would be competitive or not. I just chose seven different properties around the United States that participate. Of those seven properties only one had this promotional rate as the lowest. These rates are for one night stay on 18th of this month, checked as of this morning. Starwood Launching Points Promo On 11.11.11 For 1111 Extra Starpoints Per Stay For $11. Receive 1,111 bonus Starpoints® per stay with this offer. Right now it is not clear if this apply only for “Best Available Rates” or whether corporate and other discount rates would also qualify, although I doubt that. These extra 1111 Starpoints can be “expensive” if you need to book a special rate plan. Stay tuned for more. Remember To Check Starwood’s Starpicks Rates Every Tuesday. Starwood launches their Starpicks rates for various properties for the next couple of weeks mostly every Tuesday, although there have been gaps at times. These rates are typically available for Friday, Saturday, and Sunday nights for city properties. For resorts these rates can be available for all days. You need to book the rate by Friday. Thing to keep in mind is that these rates are prepaid and non-cancellable. If your plans change, it is unlikely that you will get a refund. Also these Starpicks rates are not always the lowest. It pays to check the normal rates using various discounts codes that one is eligible for i.e. AAA. Like Writing Hotel Reviews? Tired Of TripAdvisor? Stay Mostly At Starwood Hotels? 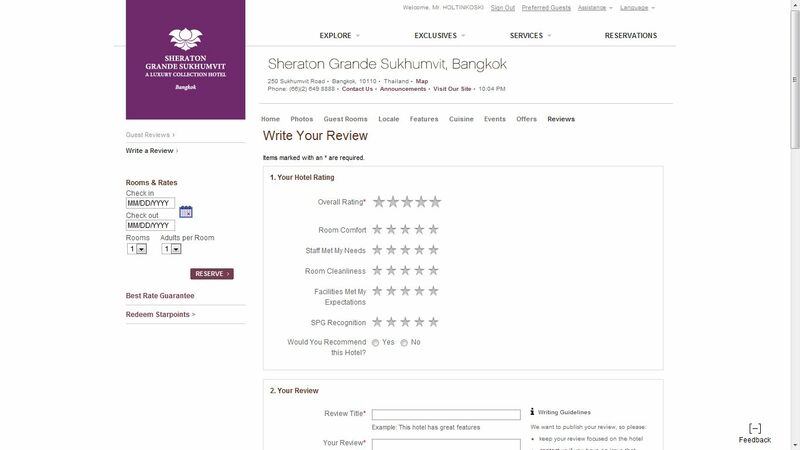 Starwood has just launched their own Ratings & Reviews where guests can review their past stay. Hotels have long been fed up with TripAdvisor reviews, because there hasn’t been a way to determine if the review was actually left by a guest, some competitor, or perhaps disgruntled former employee. With the Starwood you actually need to log in using an account that was used to book the stay. Alternatively you need to have the confirmation number and the last name. For some reason when I was trying to make a review just using a confirmation number and my last name, the system was unable to find the stay only returning an error message that the review must be left within certain timeframe after the stay. Transferring Starwood Preferred Guest (SPG) Starpoints Between Member Accounts. Starwood has always allowed members to transfer Starpoints between member accounts. 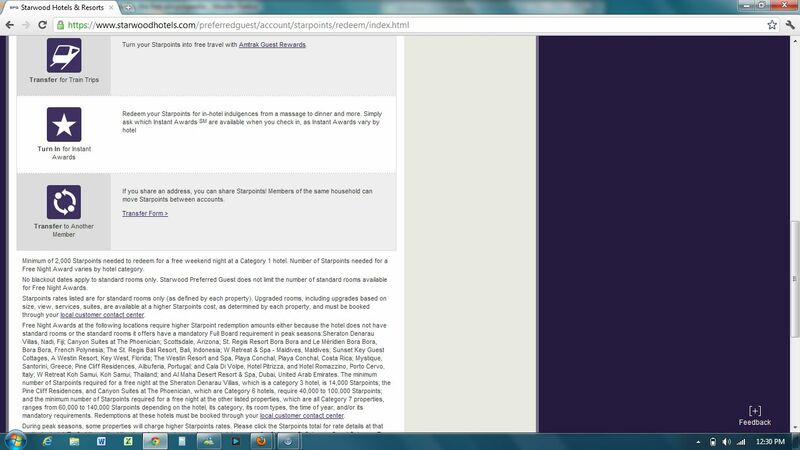 Previously it was enough that the addresses of both Starwood accounts were the same at the time of transfer. Earlier in the year Starwood initiated a process where the address must be same at least for 30 days before the transfer is initiated. Why anyone would want to transfer points between accounts, as you can always “gift” an award stay? By combining points from accounts it might be easier to hit certain transfer thresholds i.e. when transferring to airlines 20K Starpoints typically transfer to 25K miles. One party may have 100K American Airlines AAdvantage miles on his account when the desired award would require 150K. You cannot transfer Starpoints to someone else’s AAdvantage account, but you can do to his Starpoints account from where the person can further transfer them to AA. Starting October 1st Award Nights Count Toward Elite Qualification with Starwood. Hilton HHonors has awarded stay credits for award stays as long as I can remember. 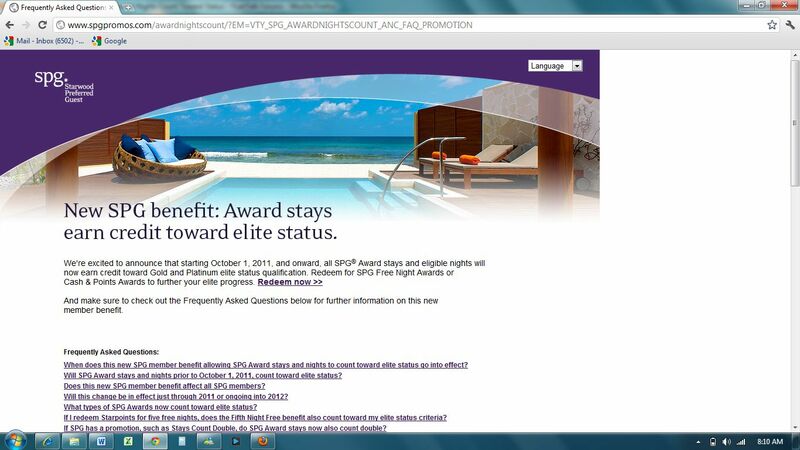 Starting October 1st Starwood has started to award stay credits for award stays as well. This helps those that tend to barely qualify for status. Good or bad? You decide. Personally this does nothing for me as I have more than 100 paid Starwood stays yearly. Note that that these award stays do not count any promototions i.e. stay three times – get a free night. SPG50 award? Worthwhile under some circumstances. Starwood has been offering this SPG50 award for 1000 Starpoints that discounts the hotel’s rack rate by 50% up to 5 days. The problem is that there is no way to check the actual rack rate online, or what rooms/suites are offered under this rate plan. When I was in Bali the other week, and wanted to check out the rather expensive St Regis resort over there, decided to check if the price using this award would be lower than any other publicly available rate. I just hate spending time over the phone especially when in Bali, but then remembered that Starwood offers chat.